SECRETS OF ALCHEMY AND THE QABALAH THE SOURCE OF MYSTIC POWER THERE IS A MATRIX OF THE UNIVERSE-LEARN HOW TO ADAPT TO IT! Great mystics throughout the ages, as well as prophets of the Old and New Testaments, tell us that the universe comes from some unknown source and is winding its way towards some unknown end, and that its true nature can only be described by means of symbols. These symbols are thoughts set forth in pictorial forms which come from the creator of the Unknowable. It mirrors both the light and darkness without which nothing could exist. It reveals within man the physical, moral and intellectual spheres of his activities in that of justice, culture and work between man and the universe and between man and God...between everything! This work strives to explain the secret wisdom of the cosmos which includes understanding the meaning of moral and spiritual equilibrium, which demands a balancing of all that exists in our lives as well as in the cosmos. 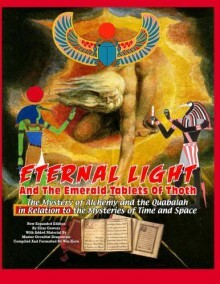 THE ETERNAL LIGHT The Emerald Tablet of Hermes Trismegistus The Precepts of Hermes, engraved upon the Emerald Tablet 1. Speak not fictitious things, but that which is certain and true. 2. What is below is like that which is above, and what is above is like that which is below, to accomplish the miracles of one thing. 3. And as all things were produced by the one word of one Being, so all things were produced from this one thing by adaptation. 4. Its father is the sun, its mother the moon; the wind carried it in its belly, its nurse is the earth. 5. It is the father of perfection throughout the world. 6. The power is vigorous if it be changed into earth. 7. Separate the earth from the fire, the subtle from the gross, acting prudently and with judgment. 8. Ascend with the greatest sagacity from the earth to heaven, and then again, descend to the earth, and unite together the powers of things superior and things inferior. Thus will you obtain the glory of the whole world, and obscurity will fly far away from you. 9. This has more fortitude than fortitude itself; because it conquers every subtle thing and can penetrate every solid. 10. Thus the world was formed. 11. Hence proceed wonders, which are here established. 12. Therefore, I am called Hermes Trismegistus, having three parts of the philosophy of the whole world. 13. That which I had to say concerning the operation of the sun is completed. THIS IS MYSTICISM FOR AN EXPANDING WORLD DRAWN FROM THE PAST TO PAVE THE WAY TO THE FUTURE!